Traffic exiting the Turnpike into Bayonne will be directed up westbound 53rd Street towards Broadway. Eastbound 53rd Street between Broadway and Avenue E will be limited to local traffic to the businesses only. All businesses on 53rd Street, including Value City and QuickChek, will remain open. The Toll Plaza may be accessed via E. 49th Street. This work will be supported by Bayonne Police. East side (entering 14A): renovation of existing Toll Utility Building will continue. Construction continues on the new east Toll Lane. Eastbound E 53rd Street has been reopened. For more information, please CLICK HERE to access the pamphlet. Widening construction continues on the ramps to and from the west bound HCE. Local street level work at Garfield, Avenue C and JFK Boulevard bridges continues. This work will also be supported by Jersey City and Bayonne Police as needed. Local street level work on Frontage Road continues. This work will also be supported by Jersey City and Bayonne Police as needed. Proposed Sign Structure Locations adjacent to the corner of Avenue B / E58th Street Corner, corner of Avenue C Structure and Garfield Avenue Structure (PSE&G Sub-Station), Toll Plaza Parking Area will be constructed. When needed, Bayonne PD or Jersey City PD will be asked to support this effort. Work continues on a VMS Sign Structure under the Turnpike Bridge over Route 440, near the Newark Bay. Access is being provided from Route 440. Deep foundation work on new bridge piers will continue near 51st Street. This work will be performed in a dedicated work zone. Bridge pier construction will continue in dedicated work zones. New retaining wall construction on Avenue E near 53rd Street will begin. On Sunday, 04/03/16, southbound Avenue E will be closed 6:00AM to 3:00PM, between 53rd Street and 51st Street for utility work. Traffic will be diverted to Broadway. This work will be supported by Bayonne Police. A two-way traffic pattern has been implemented on the bridge ramp from Port Jersey Boulevard to the Toll Plaza. Pedestrian usage of the bridge for access to and from Port Jersey Boulevard continues to be prohibited. Please CLICK HERE for shuttle bus pamphlet. The southbound Route 440 Jughandle at Pulaski Street has been reduced to a single lane. Deep bridge foundation work will continue at the Jughadle. Utility relocation work will continue on Pulaski Street at Route 440. This work will be supported by Bayonne and Jersey City Police. Ground improvement and new ramp construction continues. Bridge abutment construction will continue. In support of the Interchange 14A Improvement Project, the City of Bayonne will restore 53rd Street traffic to its former direction. The temporary westbound direction will be changed back to eastbound on Monday, 03/28/16 at approximately 9:30AM. Traffic on 53rd Street will flow one-way from Avenue C to Broadway. The southbound Route 440 Jughandle at Pulaski Street has been reduced to a single lane. Deep sewer construction continues. Temporary traffic signal work is being performed in the intersection. Temporary signals are scheduled to be activated the week of 03/21/16. This change coincides with a north and southbound traffic shift at the Pulaski Street intersection. Deep sewer relocation work will continue. Bridge abutment construction will begin. On Thursday, 03/17/16, southbound Route 440 will be shifted west at the Pulaski Street intersection to create a work zone in the median. This shift in traffic requires the southbound right lane to be closed at the Route 185 split with Route 440. Route 440 southbound will open up to two lanes immediately south of the Route 185 merge and continue in a shifted alignment through the Pulaski Street intersection. This traffic shift and the right lane closure will be in place for one year. On 03/17 and 03/18, nighttime single lane closures, 9:00PM to 4:00AM, will be used to perform roadway repairs on westbound Hudson County Extension near Interchange 14A (milepost 3.00). Temporary traffic signal work is being performed in the intersection. Temporary signals are scheduled to be activated the week of 03/14/16. This will coincide with a north and southbound traffic shift at the Pulaski Street intersection. Eastbound E 53rd Street will reopen to southbound Avenue E with access to the Turnpike (Toll Plaza) via the new Roundabout south of 52nd Street during this weekend (March 6th). For more information, please CLICK HERE to access the pamphlet. Deep foundation work on new bridge piers will continue. This work will be performed in dedicated work zones. Bridge pier construction will continue in dedicated work zones. Periodic closures of E52nd Street will be utilized. This work will be supported by Bayonne Police. Southbound Avenue E will shift west to its permanent alignment, access to 52nd Street will be from southbound Avenue E only and 51st Street will be changed to a right turn only onto southbound Avenue E during the weekend of March 6, 2016. Temporary traffic signal work is being performed in the intersection. Temporary signals are scheduled to be activated the week of 03/14/16. On or about March 6, 2016, eastbound 53rd Street, between Broadway and Avenue E, will be reopened. Normal two-way traffic will resume going in and out of Bayonne. Access to the Toll Plaza will be restored via the new roundabout south of 52nd Street. 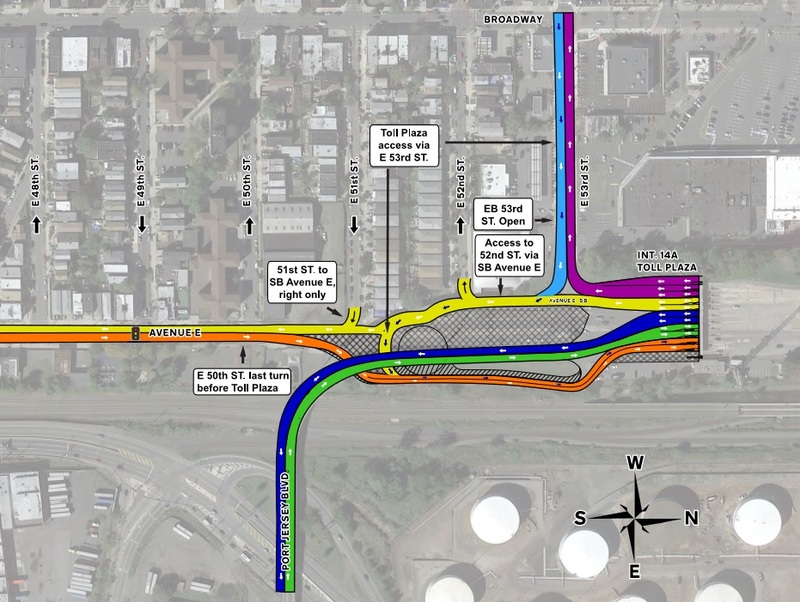 Motorists can follow the new roundabout to the Toll Plaza or continue south on Avenue E.
Access to E. 52nd Street will only be available via southbound Avenue E.
E. 51st Street will be a right turn only onto southbound Avenue E. Direct access to northbound Avenue E and the Toll Plaza from E. 51st Street will no longer be available. The last turn for motorists on northbound Avenue E will be at E. 50th Street. For more information, please CLICK HERE to view or print the full traffic shift pamphlet. Thank you for your patience. If you have additional questions, please call the toll free hotline at 1-800-671-6872. Please inform the operator that you have an urgent message and you’ll receive a return call within 24-hours. © 2019 │ Site Created by Stokes Creative Group, Inc.